The Association for Healthcare Human Resources Administration of Rhode Island (AHHRARI) is a chapter of the American Society for Healthcare Human Resources Administration - Region 1. By joining this association, you will join other Rhode Island professionals within the field of Human Resources who benefit from our state-level activities and events, as well as our nationally recognized affiliation with ASHHRA. Learn more about the benefits of becoming a member of AHHRARI. You are invited to participate in ASHHRA twitter chats on the first Thursday of each month at 10:30am PT/11:30am MT/1230pm CT/1:30pm ET sponsored by the ASHHRA Learning and Education Committee. 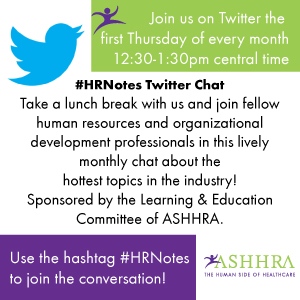 Feel free to retweet anything from the @HRNotes Twitter stream.